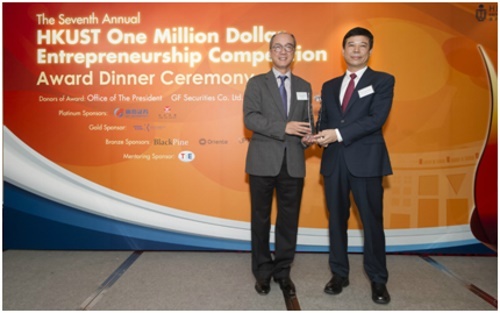 HONG KONG, June 14, 2017 - (ACN Newswire) - The award ceremony of "The 7th HKUST One Million Dollar Entrepreneurship Competition" ("the Competition"), hosted by the Hong Kong University of Science and Technology ("HKUST") Entrepreneurship Center, was held at the New World Millennium Hong Kong Hotel on 12 June. Amid fierce competition, Team Maxustech, comprised of two HKUST alumni and a current student, were the champions with their project "A Novel Sensing Technique for Smart Home Control". GF Securities Co., Ltd. ("GF Securities" or "the Company"; HKSE: 1776; SZSE: 000776), the platinum sponsor of the Competition, fully participated to support young entrepreneurs. The President of HKUST, Prof. Tony F Chan, and the Deputy Chief Executive Officer of GF Securities, Mr. Yang Long, along with other distinguished guests delivered awards to the winners and gave speeches. Mr. Yang Long, Deputy Chief Executive Officer of GF Securities, pronounced during the ceremony, "HKUST is an internationally known university, having unique experiences and advantages in the cultivation of start-ups. GF Securities, as an industry leader in investing, has a strong SME client base with many institutional clients who have gradually become industry leaders. The cooperation between HKUST and GF Securities creates an effective collaboration between excellent start-up programs and capital, helping the young to fulfill their dreams. The outstanding youth makes this country great. The youth are standing up for the country's hope and future. GF Securities is more than willing to encourage the Hong Kong youth to pursue start-ups and cultivate outstanding entrepreneurs by lending our expertise. We wish that all of the young leaders could realize their potential, dreams and inspirations on this path of entrepreneurship." The "One Million Dollar Entrepreneurship Competition" has been held for seven consecutive years since 2011, extending from a single division in Hong Kong to Beijing, Guangzhou, Shenzhen, and Macau, and is now a famous entrepreneurship contest throughout Greater China. This year, the Competition attracted nearly 100 entries from the Hong Kong division, with a total of over 900 teams from all five divisions. After months of competition, 12 finalists were selected for the championship and over HKD1 million-worth-of prizes. Some of the finalists came from numerous top universities around the world, including Harvard University, NYU Stern School of Business, University of Southern California, Hong Kong University, the Chinese University of Hong Kong, and Hong Kong Polytechnic University. Projects presented by these teams covered all walks of life, ranging from Environment & Sustainability, I.T.& Smart Tech, Fintech, Healthcare, to Robotics & AI. Each team delivered an exciting presentation during the finals and had in-depth discussion with the judges. Competition regulations stipulated that each team must have one HKUST student. Team Maxustech won the championship "President Award" and received HKD300,000 cash for their project: "A Novel Sensing Technique for Smart Home Control". Team Clare, AI and team Light Innovation Technology tied for second place with the "GF Securities Award." Respective projects, "Financial Services AI Chatbot" and "Litone LBS light-sheet system for 5D in vivo bio-imaging", each received a HKD200,000 cash award. Mr. Wu Fan, the investment director of GF Xinde Investment Management Co., Ltd. ("GF Xinde"), a subsidiary of GF Securities, was invited as one of the final judges, guiding young entrepreneurs on the start-up path. According to Mr. Wu, "we've witnessed many awesome teams and brilliant projects in this competition. GF Securities and its subsidiaries are more than willing to fully support potential entrepreneurs and help them to realize their inspirations." As one of the final judges, Mr. Wu has tremendous experience in startup investments, including various new energy and hi-tech projects through GF Xinde and helping the development of small-to-medium-sized companies. GF Securities is one of the first full-service investment banks in China. Growing with China and Hong Kong's capital markets, the Company was successfully listed on the main boards of the Shenzhen Stock Exchange and the Hong Kong Stock Exchange in 2010 and 2015 respectively. The long devotion to China's capital markets over the years has enabled the Company to build a strong SME client base which have gradually become industry leaders, with the Company's indispensable experience and expertise to single out and cultivate potential start-ups. GF Securities aims to create value and prosperity together with clients through its diversified capital market services. Furthermore, as a comprehensive capital market service provider, GF Securities always takes the initiative when it comes to social responsibility. The Company has long been supporting micro-entrepreneurship programs. Other than the "HKUST One Million Dollar Entrepreneurship Competition", GF Securities' Social Charity Fund also organized various activities in 2015 and 2016, for example the "Micro-entrepreneurial Event for College Students" and "Seeking Entrepreneurial Heroes" in Mainland China, with an accumulative investment of RMB8 million. The "Micro-entrepreneurial Event for College Students" series attracted over 100,000 students from more than 800 colleges in 2 years, with financial assistance up to RMB 8 million. Established in 1991, GF Securities is one of the first, full-service investment banks in China. The Company was successfully listed on the main boards of the Shenzhen stock Exchange (Stock code: 000776.SZ), and the Hong Kong Stock Exchange (Stock code: 1776.HK), in 2010 and 2015, respectively. Relying on excellent business performance, risk management and quality services, the company achieves sustained and steady development, and is one of the most influential securities companies in China. The Company possesses industry-leading innovation capabilities and has built a diversified business portfolio serving various corporations, individuals, institutional investors, financial institutions and governments. As of December 31, 2016, the Company operates 264 brokerage branches, providing extensive national coverage to 31 provinces, cities, and autonomous regions throughout China. For two consecutive years in 2015 and 2016, GF Securities ranked second on "Hurun's Top Brands List" amongst Chinese securities companies. The Company is actively committed to social responsibility and caring, focusing on education and poverty through "GF Securities Social Charity Foundation", and as a result has enjoyed a strong reputation and an influential brand. Prof. Tony F Chan, the President of HKUST, presents the souvenir to Mr. Yang Long, the Deputy Chief Executive Officer of GF Securities.